Did you know it’s estimated up to 35% of people between the ages of 65 and 75 begin experiencing hear loss for what they believe is no apparent reason? It’s not until they visit their doctors do they hear the word Presbycusis. It’s defined by the National Institute on Deafness and Other Communication Disorders as a loss of hearing that gradually occurs in most people as they age. By the time we reach the age of 65, we stand that 35% chance of developing this disorder. For those age 75 or older, the odds increase to around 50%. Most common in this disorder is the loss of the ability to hear higher pitched sounds, such as birds chirping or certain ring tones on our phones. What confuses us is we might often hear lower sounds, such as thunder or even conversations our neighbors are having in their yards that we can hear clearly, but others can’t. There are several causes of presbycusis and most often, they’re due to natural aging and changes in our inner ears. Each person is different and everyone’s experiences will vary, such as- how big the effect on our hearing is, when it begins, etc. We often associate aging with the physical appearance or even the physical aspects of achy joints and other so-called traditional signs, but the fact is, every part of our bodies age – even our nerve pathways. That’s exactly what most cases of presbycusis are attributed to at the core. Not only that, but generally, it doesn’t affect just one ear, but rather, both. 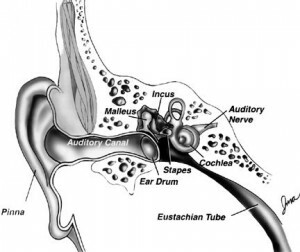 Presbycusis is also believed to begin in the middle ear as it makes changes to not only what we hear but what that information is as it travels the nerve pathways to our brain. The voices of others seem mumbled or slurred. Tinnitus (a ringing, roaring, or hissing sound in one or both ears) can also be common in those with presbycusis. As we mentioned, presbycusis is part of our aging process, but there are other culprits, as well. Medical experts believe presbycusis may be caused by changes in the blood supply to the ear because of heart disease, high blood pressure and other vascular (pertaining to blood vessels) conditions caused by diabetes, or other circulatory problems. The loss may be mild, moderate, or severe. The good news is there are things we can do to prevent or minimize the effects of presbycusis. Since awareness is key, it’s important to eliminate as many of damaging noises as possible – and it’s never too early to start. Loud motors, such as race cars, jet skis, four wheelers and others – along with guns and even loud appliances – should be treated as potential damage to our hearing. Don’t underestimate protecting your ears via ear plugs or the newer devices such as special fluid-filled ear muffs. They can provide protection and should be worn to help avoid the possibility of damage to hearing. As always, keep your physician in the loop. Our doctors are only as a good as the information they’re provided.